Athens half day morning sightseeing tour. Meals: 3 buffet type 'huge' breakfast spreads! Entrance fees during guided sightseeing tour. 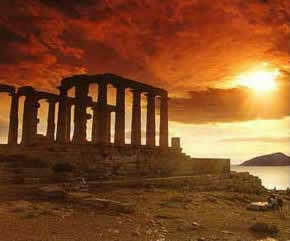 DAY 1: ATHENS On arrival you will be met by our assistant and transferred to your hotel by our taxi driver. Rest of the day at leisure. DAY 2: ATHENS Morning sightseeing tour of Athens most famous sights including a visit to the spectacular Acropolis. Afternoon at leisure. Thats a triton in the Athenian Agora pictured right and Cape sounon above left! Must see's! DAY 3: ATHENS DAY FREE. DAY 4: ATHENS / AIRPORT You will be met by our assistant at your hotel and transferred to the airport by our taxi driver for your departure flight.